Prevent minor chips and cracks from spreading. The windshield repair service seals minor chips and cracks in the windshield by injecting a polymer into the damaged area. The service includes removing debris from the area of impact and sealing the damaged area by injecting a polymer into the damaged area. Our Services Are Guaranteed Or Your Money Back! Windshield wiper blades gradually wear down after prolonged use. As this happens, your windshield wipers will leave streaks, potentially affecting your ability to see the road ahead and compromising your road safety. 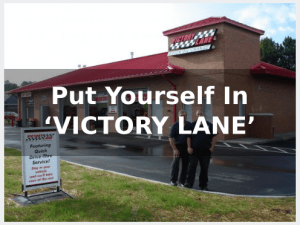 With every Victory Lane Oil Change we inspect your wiper blades and let you know if they are cracked, split, torn or brittle indicating that it’s time for a replacement. Now you can give your windshield and windows the same durable protection you’d get at a service shop. Aquapel Glass Treatment’s patented formula bonds to glass to repel rain and reduce glare to improve your visibility on the road. Use Aquapel Glass Windshield Cleaner to clean auto glass without removing Aquapel Glass Treatment. Auto glass will remain clean and protected for up to 6 months! Rain X® Headlight Restoration Kit Removes discoloration and haze from clear plastic. Over time, headlight lenses become oxidized rendering them hazy and yellow. This causes headlights to shine less brightly, which is dangerous for the driver and others on the road. The Rain X® Headlight Restoration Kit provides a deep clean to yellowed, hazed headlights with the use of a specially designed polish and sealant.